4 bedroom, 3 bathroom villa in the Sunrise Lakes community. Owned by Gerry & Kathryn Gatford. Ref: 1032. For privacy reasons, the marker on the map shows the Sunrise Lakes community location and not actual villa location. We count our villa very much as a second home, we have spent much time and effort making it into a place where anyone can feel at home, relax and use it as a base for exploring as much of Florida as possible. We like to think of it as a ‘Home from Home’ with a touch of luxury. We also have a web site with more information and pictures of our villa. Our Games Room has a Pool Table, Table Football (Foosball) an Xbox and TV. Both our Master en-suite bedrooms are the same size, which is particularly good if you are two families sharing, and both have Flat screen TVs. Our private screened Pool, with safety fence, sunbeds, covered lanai with ceiling fan & lighting, table & chairs. The Large family room with sofas, large LCD TV and DVD, with a selection DVDs and board games, central ceiling fan and doors leading to the Pool. Our Kitchen is fully fitted and well equipped for family needs, there is a breakfast bar and dining area, a separate laundry room with washer and dryer leads from the Kitchen. Linen and towels are all provided. Younger visitors are well-catered for with a crib/playpen, high chair, and safety fencing for the pool area. We have a strict non smoking policy in our villa,and sorry we do not allow pets. 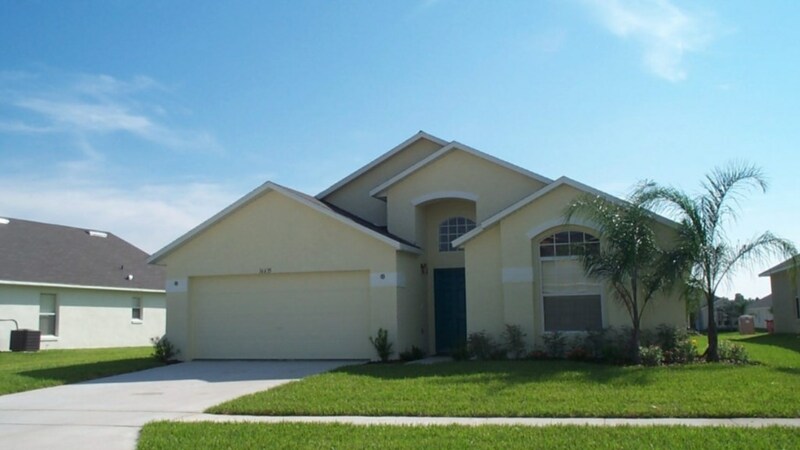 The Sunrise Lakes Community is situated off the 27 that runs from the 192 (Disney end) and is only 5 miles from Interstate 4. Disney World is only 9 minutes away and other Florida attractions are within easy reach. A variety of shops including a Large Wall Mart, Publix, Super Target, Walgreens, CVS all less than a mile away, and a Winn-Dixie just up the road. On arriving and opening our front-door the welcoming foyer sets the tone for our spacious, well-equipped, beautifully furnished, modern family villa. Our Villa sleep 8 with a crib/cot for a baby. 2 Master en-suite bedrooms both with US king-size beds. Our rear master bedroom has a TV and direct access to the pool area. The en-suite bathroom has shower, bath, toilet, large closet with hair dryer and linen (including towels) provided for guest use. The furnishing is of a wicker-style with Palm-trees as the theme. Our front master bedroom has a TV, en-suite bathroom with shower, bath, toilet, large closet with hair dryer and linen (including towels) is provided for guest use. The furnishings are grand with gold and cherry-wood finish. Our two twin-bedded rooms, both have large closets sharing a bathroom with shower, bath, toilet and hair dryer and linen(including towels) is provided for guest use. Our private screened Pool has a safety fence, our Sun-beds are ideal for spending a relaxing day between busy park days and for topping up the tan. On our covered Lanai we have a ceiling fan and lighting, table and chairs to sit, chat and eat out al-fresco or while away the evenings with a late night swim. Kids and Parents heaven - while parents relax by the pool the kids can spend all that energy playing in the games room with pool table, table-football/Foosball. For those games fanatics who need to keep up their skills we have an Xbox and TV with a selection of games. Our Family room with sofas, a large LCD TV with surround sound a DVD player and a large selection of DVDs, plus a selection of board games. Our Family room is central to the villa with Patio doors leading to the Pool Area, door leading to one of the Master Bedrooms and the hallway to the twin-bedded rooms. We also have a large remote-control ceiling fan in the family room. Our kitchen has a high-ceiling giving a feeling of space and is fully fitted, large fridge-freezer with ice-maker, dishwasher, cooker, microwave, waste-disposal unit, wide-range of crockery, cutlery, glassware – in fact everything you’d need to be able to cater for any size family. This area is shared with the kitchen for easy family-use, the dining table seats 6 comfortably with an open-plan breakfast bar. Our dining area is good for your family meals and planning all the days activities. International Drive, Sea World and Universal Studios 20-30 minutes. Clearwater Beach - 90 minutes. All rates are inclusive of Florida sales tax. A non-refundable deposit of £200 / $200 is required at the time of booking with the balance due 10 weeks before departure. Refundable Security deposit of £200 / $200 is payable with the balance. This is refundable once the management company have confirmed that the home has not been damaged or utility bills excessive. No extra charge for Crib / Cot or High Chair. Rates are for our villa (not per person) We offer discounts for late Bookings, and long stay bookings, just contact us for a quote for your stay. 01 May 2019 to 18 May 2019 - use the form below to enquire about these dates. Your enquiry will be sent to villa ref 1032 only. This page has been viewed 18138 times since 21 Oct 2003.